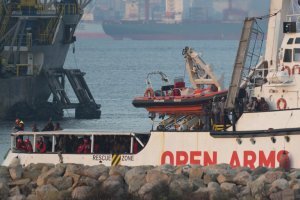 A charity rescue boat carrying 311 mainly African migrants plucked off Libya docked in Spain on Friday, ending a traumatic journey which saw them spending Christmas at sea and several European nations denying the vessel entry. Proactiva Open Arms, the Spanish charity which runs the Open Arms vessel said the migrants – who include pregnant women, children and babies – were mainly from Somalia, Nigeria and Mali. The ship docked in the port of Crinavis, in San Roque, near the city of Algeciras. ‘Good morning, Open Arms is already in the Bay of Gibraltar and is steering towards the only port available to it in the Mediterranean. Mission accomplished,’ tweeted the charity’s founder Oscar Camps. ‘These are people, both children and adults, who have had really horrible experiences in both their countries of origin and during their journey,’ said Vicente Raimundo, the director of intervention in Spain for the NGO Save The Children. He said some of the 139 children aboard came ‘from countries at war such as Somalia and Syria’. The migrants started disembarking at around 10:30 am, with children and women getting off first. They were met by Red Cross officials who gave them clothes and food and conducted medical tests if required. The migrants were rescued on 21 December from three vessels but were denied entry by Italy and Malta. Libya, France and Tunisia did not respond to Proactiva Open Arms’ requests for permission to dock, Madrid said. It will be the first time since August that Spain has allowed a charity rescue ship to dock and unload migrants in the country. In August it had suspended its missions, accusing governments, and Italian Interior Minister Matteo Salvini by name, of ‘criminalising’ migrant rescue charities. Salvini has denied the groups access to Italy’s ports, accusing them of acting as a ‘taxi service’ for migrants. Malta too has been increasingly unwilling to host rescue vessels. ‘Your rhetoric and your message will, like everything in this life, end,’ Proactiva Open Arms’ founder Camps told Salvini on Twitter earlier. More 56,000 migrants have arrived in Spain by sea this year, and 769 have died trying, according to the IOM.